In this information age, it’s fast and easy to find information. But it can be time-consuming and difficult to find accurate, verified, trustworthy information when you need it. That’s why Omnigraphics has created these ready-reference directories—to put a wealth of information at your fingertips. The listings and contact information are continuously and professionally verified, giving you confidence about the reliability of the source. Omnigraphics’ directories are consistently recommended as authoritative and convenient ready-reference sources by Booklist, Choice, Library Journal, and other library reviewers. For specific details on the directories, see the individual titles, with descriptions and sample pages. 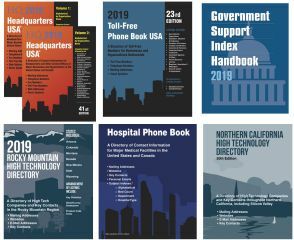 A new print reference bundled with an interactive database of assistance programs with searchable categories of need and application deadlines by each overseeing agency with locations and contacts. Verified, accurate, up-to-date contact information for all types of businesses, industries, and related organizations. Hospital Phone Book, 52nd Ed. Provides over 60,000 contacts at 9,000 hospitals and medical centers across the United States and Canada. Provides updated contact information, demographic and statistical data, and more for all major U.S. cities and smaller cities that are popular relocation destinations. Northern California High Technology Directory, 30th Ed. This annual directory features high-tech companies and key contacts throughout Northern California, including the Silicon Valley area. A fully-indexed directory featuring high-tech companies and key contacts in the Pacific Northwest (including Oregon, Washington, Idaho, Alberta & British Columbia). Parks Directory of the United States 7th Ed. Comprehensive reference source provides updated contact information and more on over 5,000 national and state parks, and designated recreational, scenic, and historic areas in the United States and Canada, with facts about urban parks, and park-related organizations. Features high-tech companies and key contacts throughout the Rocky Mountain region, including Arizona, Colorado, Montana, Nevada, New Mexico, Utah & Wyoming.